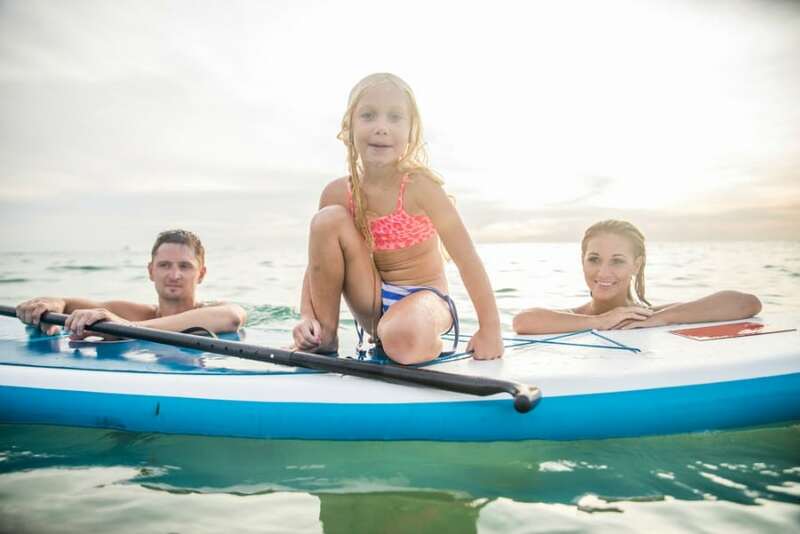 If you vacationed near a body of water recently or live in an area where water sports are popular, you’re probably familiar with paddle boarding. 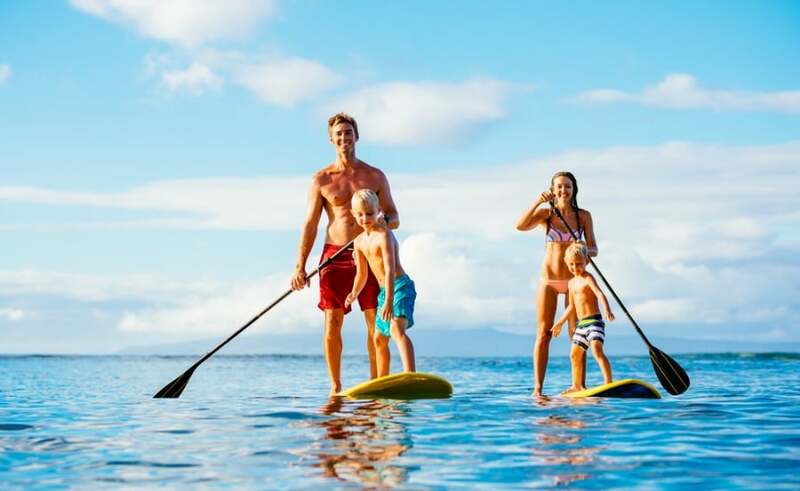 Developed in Hawaii, this sport has increased in popularity in recent years among people of all ages and can be enjoyed just about anywhere water is found. What to look for in an inflatable paddle board? The most popular form of paddle boarding is stand up paddle boarding (SUP), and its premise is simple. You stand on an inflatable or solid board and use a paddle to propel yourself through the water. Unlike surfing, you can go to waves instead of waiting for them to come along, or you can choose a calmer spot through which to paddle. Getting started in this sport is easy when you know what kind of beginner stand up paddle board to look for and aren’t afraid of taking a few tumbles into the water as you learn the ins and outs of maneuvering. If you’re ready for a fresh adventure out on the water, stand up paddle boarding could become your new favorite activity. Why is Paddle Boarding So Popular? Although the concept has been around for a long time, interest in paddle boarding exploded in 2013, making it “the outdoor sporting activity with the most first-time participants in the United States that year.” In 2011, around 1.2 million people tried the sport for the first time, and participation grew 120 percent between 2013 and 2016. When compared to other water sports, paddle boarding is just about the only one showing a recent upward trend in Google searches. One likely reason for this sudden popularity is the accessibility of paddle boarding. Unlike more vigorous forms of exercise and some high-impact sports, there are few barriers to getting started. You don’t need a gym membership or an excessive amount of expensive equipment to learn to paddle board. Paddle boarding is low-impact, so it doesn’t put strain on your joints. At the same time, the activity provides a total body workout suitable for those looking to lose weight, build strength and increase endurance. All age levels can participate and enjoy a sense of community and camaraderie with fellow paddle board enthusiasts. How Can You Learn to Paddle Board? Because paddling has become so popular, there are likely classes or groups centered around the sport in your area. Joining one of these is preferable if you prefer hands-on instruction. However, if you can’t find a local instructor, there are plenty of online resources to get you started with paddle boarding. A quick YouTube search turns up multiple “how to” videos, including the most popular instructional primers for beginning paddle boarders. Once you’ve watched a few of these, it’s time to take what you learn and put it into practice. Learning by doing is the best way to get started with many activities, including paddle boarding, so don’t be afraid to jump right in. To get a feel for paddling, start out practicing your technique with your board resting on the sand. This will make it easier to maneuver the board when you officially hit the water. Everyone falls down a few times when they’re first learning, meaning you have to be prepared to get wet during your first attempts. Just be sure to angle your body away from the board as you fall so that you don’t hit it on the way down. What Should You Look For in an Inflatable Paddle Board? When you start shopping for a paddle board, you’ll find both solid and inflatable models. 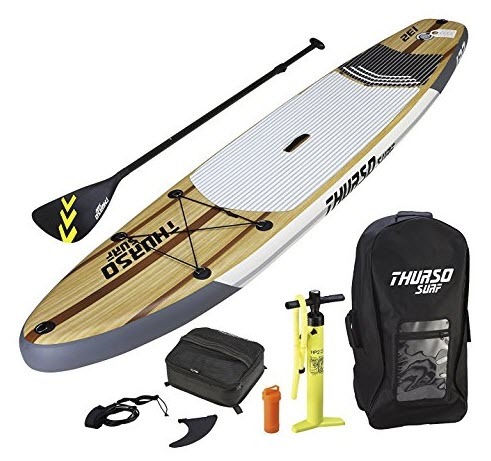 Inflatable boards are generally the best choice for beginners and people who travel a lot, and you have multiple size and shape options from which to choose. What types of water will you spend the most time in? Are you taking up paddle boarding for adventure, leisure or exercise? Your answers help you determine the characteristics your board should have to provide maximum efficiency. Length and width are the main considerations. A board of 9 feet to 11.5 feet in length is appropriate for the average paddle boarder. If you want to race, go for a board between 12.5 feet and 14 feet. Longer boards are also useful for lengthy paddling sessions. Most paddle boards come in widths between 25 and 31 inches. The wider the board, the more stable the ride. Narrower boards are faster and more versatile. As a beginner, a wide board is best for preventing you from falling into the water. Wide boards also give you space to carry extra gear and are more comfortable for leisurely trips and the growing practice of paddle board yoga. Board volume, which is measured in liters, expresses how well a board will float and how low it will sit in the water when you’re on it. You also need to pay attention to weight capacity, which tells you how many pounds the board can hold. Remember to include not only your own bodyweight but also the weight of the paddle and any other gear you intend to bring along on your paddling sessions so that you purchase a beginner stand up paddle board with enough support. Choose a displacement hull if your main bodies of water for paddling are calm or you’re up for some racing. For catching waves or other types of paddling where stability and lift is desired, go for a board with a planing hull. It might be helpful to have an experienced paddle boarder shop with you when buying your first board. You can also try out different types of paddle boards if you have friends who are into the sport to find the right size, hull shape and fin setup. Don’t forget about accessories for your paddle board experience. A leash is an absolute necessity for the times when you fall into the water when learning to paddle or first taking on rough waters. Leashes ensure your board never drifts too far, leaving you without something to which you can cling. It’s also important to invest in a personal floatation device (PFD) for added safety when paddling. The paddle itself should be made of high-quality but lightweight material to prevent injuries and make it easier to maneuver your board through the water. If you do decide on a solid board, make sure you have enough room to store it in a place where it won’t become damaged. You’ll also need a rack for your car and a reliable way to secure the board during transport when you head out to seek your next paddle boarding adventure. By now, you should have a good idea of what kind of board would be best for the type of paddling you want to do. 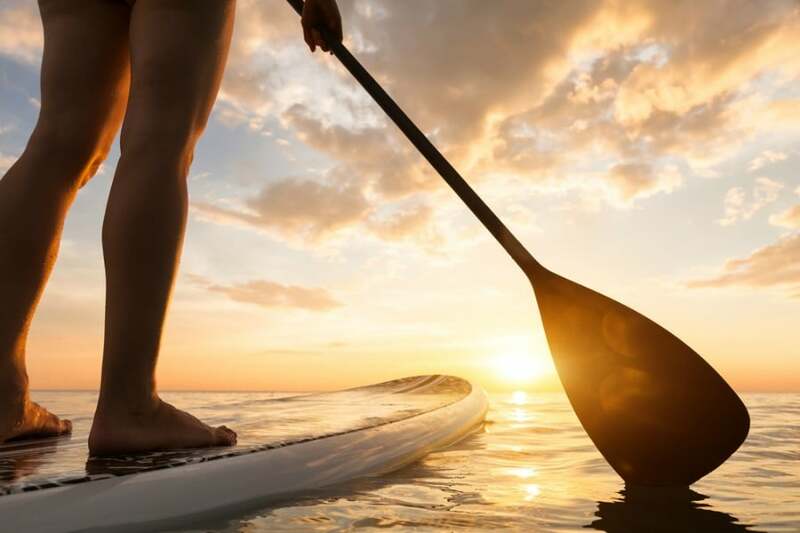 These five boards are highly rated by SUP enthusiasts and come with a variety of accessories to give you all you need for the best paddle boarding experience. 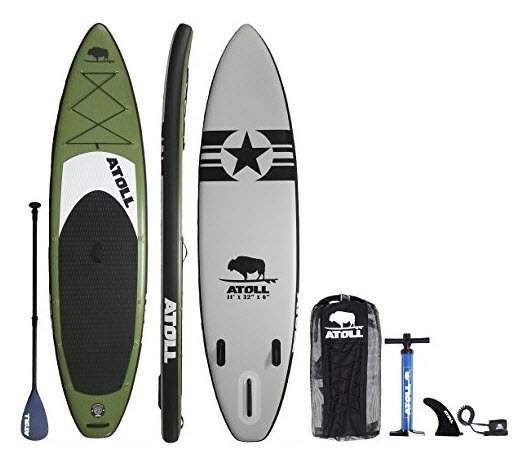 This complete paddle board package from Atoll features an 11-foot inflatable board, a hand pump and an adjustable aluminum alloy paddle. At 6 inches thick and 32 inches wide, this board is just right if you’re a beginner or if you’re more experienced but prefer to take a leisurely approach to your excursions. Whether you’re on a camping trip or looking for adventure, the Atoll board offers a balance between rigidity and lightness. Dual layers of PVC fabric add durability without weighing the board down. The tri-fin design increases stability, and the included leash ensures you’re never separated from your board. Pack everything up in the handy backpack to get ready for your next excursion. The CRUISER paddle board from iRocker is 10.5 feet long, 33 inches wide and 6 inches thick, making it suitable for all experience levels. Boasting an “extra wide” tail end, the board gives you the stability you need while learning and when venturing into rougher waters. 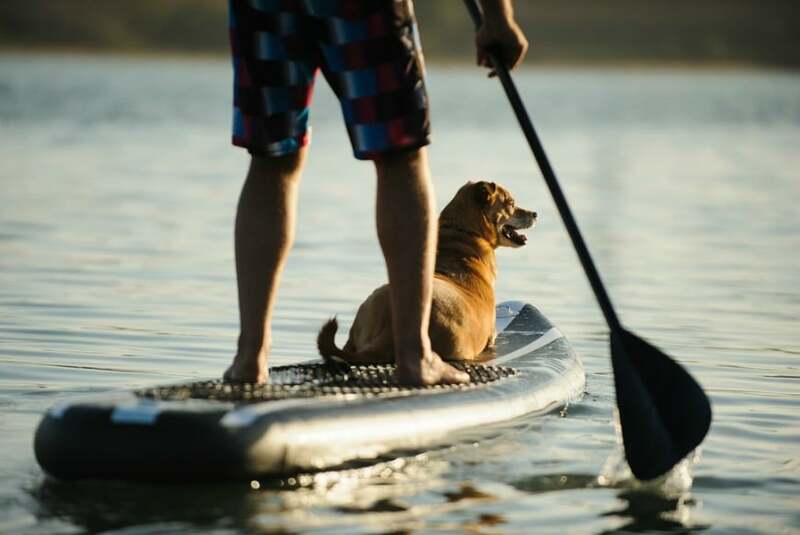 Use the included fiberglass paddle to maneuver wherever your paddle boarding travels take you. Lightweight and durable, the CRUISER cuts through calm waters, rides waves and handles whitewater conditions without any trouble. With the included hand pump and carrying bag, your board can easily go anywhere you do. For the true adventurer seeking a sleek board designed to inflate and deflate quickly, this bundle pack from XTERRA is the way to go. You get a paddle, ankle leash, hand pump and repair kit along with your board, so you’re ready to go from the moment you open the box. The board inflates in five minutes and includes a valve for quick air release, allowing you to move from one body of water to another without slowing down. With its generous 10-foot length and tapered body reminiscent of a kayak, the XTERRA inflatable board is ready to carry you through even the most challenging bodies of water. Do you like to make paddle boarding an all-day affair or take long camping trips to check out new waterways? Try the Thurso Surf Waterwalker. Available in 10.5-foot and 11-foot lengths with a thickness of 6 inches, the Waterwalker is built for lengthy excursions. This pack provides all the gear you need, including a paddle, pump, backpack and leash. A 2+1 fin design stabilizes the board as you paddle, and a deck bag provides space for food, water, and anything else you want to take along to fuel your adventures. The military-grade PVC fabric exterior sports an attractive wood design on top, so you’ll not only have a strong and durable board but also an eye-catching presence whenever you’re out on the water. 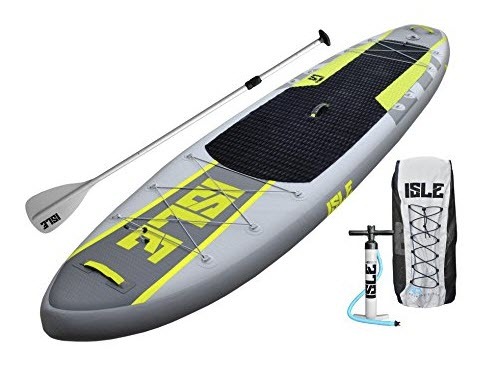 When you just can’t wait to get going on a paddle boarding trip, grab the Isle Airtech Inflatable Explorer. 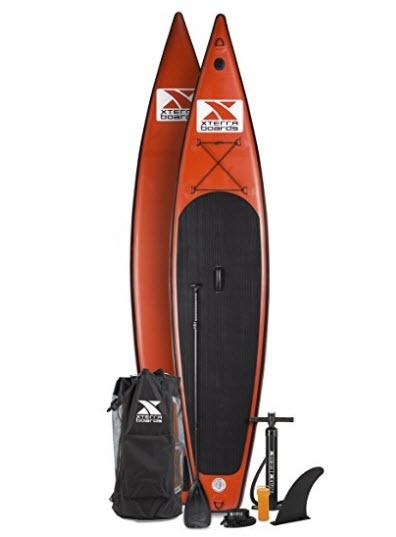 This bundle includes an 11-foot by 32-inch by 6-inch board, a pump, a paddle and a carrying bag. Crafted for durability, the Airtech is sized just right for beginners and includes extra space for storing additional gear. With so many boards available and new frontiers to explore, paddle boarding has a wide appeal. Why does the sport interest you? What are you looking for in a paddle board, and do you prefer inflatable boards or solid models? Share your thoughts in the comments. Which inflatable sup would be good for a beginner? Hi Sarah, any of these boards would be suitable for a beginner. 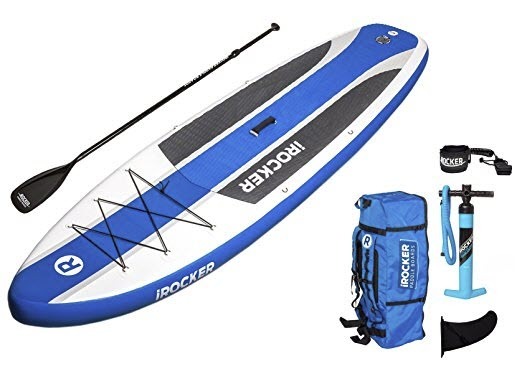 That said, my preference would be the iRocker Cruiser for a versatile entry level board, or the Xterra if you think you might like to try some more open water paddling. 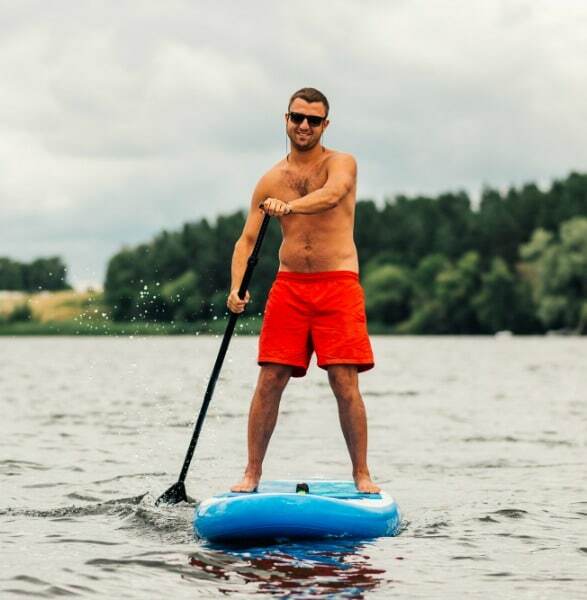 The first thing in paddle board you should look at is what is the material is made from and what is the weight of it is it capable to load two people easily if yes then buy from the market but from my view you should go for I rocker cruiser as it is capable to carry weight of the two people and other food items can be easily carried out.